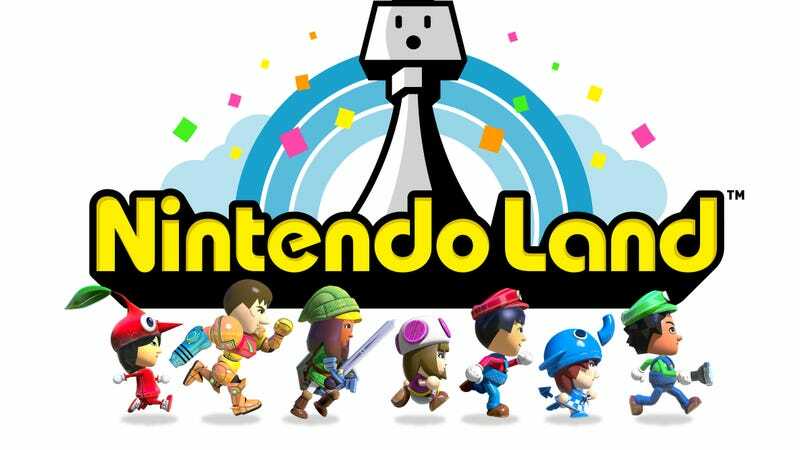 I already declared that Wii U launch game Nintendo Land is Nintendo's most important game of 2012 and it wouldn't be that much of a stretch to suggest it could be their best game. It's been an ok year for Nintendo releases, but it's not like the makers of Ocarina of Time and Wii Sports have recently released any instant classics. Nintendo Land doesn't have to be that amazing to outshine, say, Kid Icarus: Uprising or Rhythm Heaven Fever. But maybe we don't have to handicap this thing or give Nintendo Land some sort of special launch-game caveats. I just played the Wii U's flagship game yesterday. Third time I've played it this year. And I liked it more than ever. I liked it for its multiplayer. I liked it for its single-player. I liked it because it seems to have some cool easter eggs for long-time Nintendo gamers. And I liked it because it seems like it's got way more good content than is implied by the Wii Sports comparison it invites. The basics, as we've covered before, is that the game is presented as a theme park for Wii U owner's Mii characters. It contains 12 "attractions" that Nintendo reps argue (more and more convincingly) are more than mini-games. Six are designed to be played solo, six multiplayer, competitive or co-op, depending on the design. The first time I was shown the game, back in early June, Nintendo reps showed me a 2D Donkey Kong puzzle game, a 3D co-op Zelda-themed linear adventure and a top-down competitive multiplayer Animal Crossing-themed chase game. The games were fun but the impression I got was that Nintendo Land's attractions were designed to train Wii U owners to use the Wii U's various control schemes. After all, the Wii U's main controller, the twin-stick GamePad that has a six-inch screen baked into it, is weird. It's not like any controller people have used before. Donkey Kong was teaching players to use the GamePad's tilt sensors; Zelda and Animal Crossing showed how a multiplayer game would work when it gives one player a view of the action on the GamePad and lets other players view the game on a TV in split-screen, possibly strategizing against the GamePad player, in the case of Animal Crossing. Nintendo Land&apos;s Donkey Kong&apos;s Crash Course has nothing to do with bongos, nor the jungle. I played Nintendo Land again in the early summer and then again yesterday. When I played it yesterday, I tried a Metroid mode, a Mario one, a Pikmin adventure and an homage to Balloon Fight. Our own Jason Schreier tried the Metroid attraction in Nintendo Land. We ran video of it. The player on the GamePad controls Samus' ship and plays this as a flight combat game, locked in an arena. The players with the Wii Remotes control Miis dressed as series heroine Samus. This game alone has three modes: assault mission (co-op), surface-to-air combat (competitive) and groundbattle (Samus vs. Samus). It seemed to have more than 10 arenas, based on the number of level selection items in the preview build (subject to change? I couldn't tell; Nintendo reps couldn't say). And it had one of those great little Nintendo design touches: Samus players could look to the sky, press a button and grapple to the spaceship and then shoot enemies while dangling from the ship, while the GamePad player flew around. It also had the kind of fan service that I think will delight people who don't need to be told who Samus is: one of the Miis was dressed in Samus's standard yellow and red suit. The other in the game I played was in the yellow and blue Samus suit from Metroid Fusion. Nice nod to the fans, Nintendo. Jason had also already played the Pikmin game, which is a co-op adventure that makes one player the Captain Olimar-like leader and the other players as extra Pikmin. He played it in September. Again, my takeaway is that this wasn't just fun but surprisingly rich in content. The Pikmin attraction can be played in "challenge" or "vs" modes. It seems to have more than eight levels and each level has multiple boards to clear. You're running through these boards, which look more or less like cramped levels from classic Pikmin games, fighting bug enemies, collecting nectar, leveling up Pikmin and fighting bosses. The first level is three sections. The second level, a Nintendo rep told me, is even longer and ends in a tough boss fight. This is more content than I expected, and well-designed to boot. You Asked For More Pikmin, So Nintendo Is Giving It To You. Twice. Pikmin 3 isn&apos;t the only Pikmin game on Wii U. The Metroid and Pikmin attractions had me thinking that there's more single-player game potential in Nintendo Land than I'd first thought. There are batches of boards to clear, challenges to solve. There even appear to be Achievement-like goals that lead to unlocks elsewhere in the game. There is a big hub world—the Nintendo Land virtual theme park—that Nintendo hasn't even shown much of. I expect that a fair amount of Nintendo-themed stuff will be unlocked there as you play. The games don't all seem hefty. The Mario Chase mode seems like it's just a short three-minute game set on any of three levels. It's a very good, simple party game—the GamePad player can see the entirety of a maze and wants to run around, undetected for three minutes while multiple Wii Remote players share a split screen view of parts of the maze on a TV and try to team up to track the Mario player down. This is more of a Wii Sports-scale game, for better or worse. This is probably the one to try at a party. It does have another classic Nintendo touch: the GamePad camera shoots a video stream of the GamePad player's face. So... imagine you're the GamePad player, you're hiding, you hear the other players talk about where they think you are. They can see the video stream of your face. So... how good is your poker face? Do you smile when they say they think you're in the green area when you're really in the red? Do you smirk and give yourself away? The oddest and most interesting game I tried was the one based on the old Nintendo game Balloon Fight. This one, which is made for solo play, actually is made to train you to play the Wii U. Its tutorial nudges you to learn how to split your attention between the GamePad screen and your TV. You swipe on the GamePad to make a man tethered to a few balloons float through the sky, passing through the sky as the days and weeks tick by. To avoid floating spikes, just swipe up or down, left or right with the stylus on the GamePad. But you will sometimes get near an enemy, also suspended by balloons. You need to tap their balloons. You can't do this without looking down at the GamePad screen so you can see where your stylus is tapping. The view on the GamePad screen is tighter, so you can attack the enemy precisely. Is this split-attention thing good? I'm not sure. It's odd, interesting and, well, wrapped up in a game that looks quite lovely. I can't forget how bad an impression Nintendo Land's throwing-star game made on me, how it made the otherwise-impressive GamePad seem like an uncalibrated mistake. I think Nintendo Land may include some clunkers amid its 12 attractions. The more I play the game, however, the more I find to enjoy, the more I think of this not as a bunch of cobbled-together tech demos but as a fitting tour of some of Nintendo's top franchises, presented as a batch of games. I now expect the game to hold up for more than an afternoon and be entertaining even when it's not time to show the Wii U off at a party or to the folks after Thanksgiving dinner. Nintendo Land will be out on November 18, alongside the Wii U and will be bundled with the $350 deluxe version of the console.